Puma Uproar Palace Guard – Releasing March 8th! Team Bacon vs. Team Classics – which team are you on? December 28, 2018 (NEW YORK) —As David Jacoby recounts their first taping together, Jalen Rose laughs. He’s certainly heard this story before. Who knows what exactly he finds humorous? Yet each Hahaha! sounds genuine. At a lunch spot near ESPN’s new Manhattan studios, a re-run of Rose on Get Up! airs in the background as the man himself chuckles at Jacoby’s one-time discomfort. 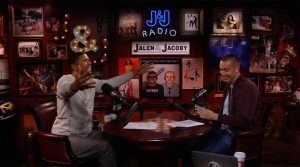 Jacoby opened The Jalen Rose Report back in 2011 by explaining what the new Grantland Network podcast would cover before introducing his co-host.